Are you a newer or young entrepreneur looking to build some cred in your business and quick? Apply these 5 principles and watch your business soar. Transitioning into postpartum life is such a delicate time. Learn my top tools, product reco’s and spiritual practices to help you navigate this beautiful season of life. 1. Aligning with the work you’re meant to do, the person you’re here to be and work the world needs for healing. In this way, it’s about healing the collective and not just signing up for a salary, a quick fix or making it all about your own personal gain, fears or needs. We’re in the final phase of completing part of the upstairs renovation within our home and it’s been so fun. We still have lots of work to do as we go around and intentionally upgrade our space to match our personalities and what we truly desire during this next season of our life: minimalism, a calm home that feels spacious and free and light and creative, and a healthy home to raise our girls in. As we’ve built out a wildly successful business over the past few years our teaching has shifted. We know we’re here to help people achieve big yes, but to do so with soul and grace. In alignment with God/their inner teacher/your higher self, whatever word resonates for you there. Every year we clean out and detox a few areas that feel heavy. That good old kitchen junk drawer, closets that need a refresh, old toys that we can donate. Always, always aim to make space for the new and fresh. Experts say that those who have a clean car and a clean home minus any junk, clutter or trinkets actually have a clearer headspace. If you’ve followed my journey on Instagram or Facebook you are likely aware that 3 months ago my brother took his own life. I was pregnant at the time and my pregnancy was keeping me glued together so to speak. I felt like I couldn't completely meltdown because emotionally I wanted to be stable for the baby. So what exactly is surrender? There are many teachers of this concept today and for many people it’s not new because so many great men and women have gone first, writing books, and doing beautiful work behind the scenes in this field. They’ve paved the way so to speak. (Teachers like Marianne Williamson and Gabrielle Bernstein for example. Even modern day preachers and ministers are doing such a great job at bringing forth this message to the masses in a way that isn't so scary. Some of my favs: Joel Olsteen and Bishop TD Jakes). Story time! A few years ago I left a stressful job that was robbing my soul. I may look happy on the outside here, but my insides were screaming at me. I know so many people have a cliche story like that, but how much truth lies within those key cornerstone moments? The one’s where you decide that you’re worthy of something greater. 5 ways to integrate peppermint essential oil into your life. Exploring all the magnificent ways pure and potent essential oils can completely change the game for you and your family. I see life as a game — do you? Think of it like a great athlete or coach. There is the prep work. Which involves the ‘know how’ or in other words the ‘recipe' for success. There is the belief in themselves as they put in the work and of course the trust factor. Trusting those who are living out and/or those who have helped others live out a beautiful life. And then there’s the magic that starts to pour when they put their recipe into action. This is what happens when I start to see women and families integrate essential oils into their life. Women are usually drawn to doTERRA at a key time. They are open and ready to adjust their ‘recipe' so they can experience full blow vitality and flow. Their current recipe is usually pretty good when they start to integrate essential oils. But from experience I’ve noted, they are usually drawn in at a time when they’re ready to blow issshhh up in the health’care’ and self-care department. First thing in the morning, take a deep inhale of peppermint and then swipe 1 drop onto the back of your neck. It’s cooling and invigorating, wakes you up and puts some pep in your step. I'm currently doing this daily before I visit my personal trainer and get my a$$ kicked hehe. Turn on the diffuser in your kitch, adding a few drops of peppermint and a few drops of either wild orange essential oil or grapefruit essential oil. When using doTERRA, you’ll only need a few drops because of how pure and potent they are. PS: So many people ask me where to get a good diffuser. I love doTERRA's petal and/or Lotus diffuser. I also love diffusers from amazon and honestly, you can get good diffusers today from pretty much anywhere. It's the oils that you want to ensure you're getting the best quality, diffusers don't matter so much. Carry a peppermint roller bottle that comes pre-diluted with fractionated coconut oil in a handy dandy oil pouch of your choice. Roll this baby onto your tummy post lunch or dinner for extra digestive support. Add 1 drop to your morning organic coffee and blend in a blender. Hellooooooo! Let's explore some of the most frequently asked questions I see popping up within the essential oil and network marketing industry today. As always, I'm here to spread the truth and stand for you highest potential. Q. Where can I learn more about doTERRA as a company? Q. How much money do you make per month? A. Right now as a Blue Diamond leader I average between $28,000.00 - $30,000.00 per month in Canadian dollars. I am obsessed with teaching women how to earn abundantly, so you can free up your time to serve in a way the world really needs you to! Q. What does the average person get paid? In doTERRa 62% of people who choose to work the business are at the Silver rank or higher which is the foundational leadership level in the company. This is an incredible number. Again, not everyone wants the responsibility of a larger business, some just want an additional $1,000.00 per month as a Silver leader. Some want to build to the Gold or above rank and some want to go all the way. The choice is yours! I decided pretty early, once I became educated on the model, that I was going to go all the way. I was blown away at what was possible in terms of how I could help people and how I could help my own family. Here are doTERRA’s average earnings. Q. What makes doTERRA unique? A. I believe you want to look for a few things when considering partnering with a brand, product or person. Integrity of course and the owners have this, hands down. The marketplace. Natural health and healing is booming and it's not going anywhere. It's the wave of the future. Retention. doTERRA has the highest retention in the industry. In my own business for example, with just over 7,000.00 customers from 19 different countries around the world, 85% of people who joined myself as a customer, or one of my teammates as a customer, ordered products again within a 12-month period. That is powerful business retention friends! Also, the doTERRA culture of support is like a warm hug. Read more below on that. Lastly, most people who join doTERRA join to use the products. It's a value driven company with a heart of gold to serve. Check them out on Facebook and Instagram. Q. I know there are tons of great network marketing companies and so many businesses are moving towards this model. But I’ve heard a few weird things about it, can you explain? A. I love this question. No one really questions network marketing anymore because of how brilliant the sales model is. Every now and then someone with old school thinking might attack the sales model but here is what I’ve come to compassionately see within my experience: This is simply their belief system, typically based on a bad experience. Maybe they had a cousin who was selling protein powder and said cousin was really bad at it. Maybe said cousin bugged them all the time or just spammed their protein powder sales on Facebook all the time without actually adding value or building a relationship. Kind of like the life coach that just pitches their program all the time. Or the weirdo cold callers who try to sell you an upgraded furnace. Kind of annoying, I get it. This is something you probably won’t ever get away from, some people just refuse to learn postured business skills, like in any industry or career. When I was a cop for example, there were some great cops, and some questionable one’s who gave policing a bad rap. When you go through the Tim Hortons drive through, you’re going to have some great customer service and at times, some bad customer service. The key here is to be open and understanding. Every now and then I hear a health coach for example who slams network marketing and I know in my heart what’s really going on. They are being unsupportive and missing the mark with compassion for what some of these people are doing, which is simply trying their best and following their heart. That’s definitely not my vibe, to diss people who are following their heart and trying their best and I find it quite rude. But to each their own. Also, just to define network marketing a bit further. It’s a relationship business and people love that. Most people are starting to get annoyed with purchasing crap filled products from drugstore perfume reps for example, who know nothing about the truth regarding what is safe and healthy for the body. They want to purchase from people they know, like and trust, and those who are setting a great example by how they live. This is the wave of the future. Lastly, the network marketing sales model is extremely fair and abundant! You get paid, for how much you help people. I’ve helped hundreds of people get rocking on their oil journey and I’ve trained and helped many women who want to start the business and grow their personal leadership skills. THIS is why I’m successful. I care about people (I really, really care!) and I’m passionate about what I do. In fact, it’s my belief that this is THE MOST spiritually charged business on planet earth and is made for those who have a big heart. It will help you grow into the person and leader you’re really here to be, faster than anything else. If you're not into that kind of thing, this probably isn't for you. Q. How much time does it take? I started earning 5 figures per month, 5 years in, and I’m growing to a million dollar business towards the end of this year. Q. Is doTERRA embraced by modern medicine? A. Yes! Check out this video of the doTERRA medical advisory board, which includes a board certified surgeon; ear, nose and throat specialist; dentist; anaesthesiologist; family physician; pediatrician; and gynecologist. An integral part of doTERRA's mission is to bring together healthcare professionals of traditional and alternative medicine to encourage further study and application of essential oils in modern healthcare practices. Are you a health care professional? Check this out or message me for more details. I have a few healthcare professionals on my team already who are part of this initiative! Q. What do the most successful people on your team do well? A. Hands down, they are open and coachable to what successful people who have gone before them, teach them. And, they are interested in growing themselves personally, more than anything else. They lead by example. They're also not afraid to invest in themselves. Like I mentioned, I started with ZERO experience but I did hire a few successful people who helped me to grow into the leader I am today. My best people also follow their heart and they tend to have a very open energy to believing a higher power is guiding them. They see they’ve been guided here for a reason larger than themselves and they take full ownership of that. Q. Does doTERRA test on animals? Q. What makes their sourcing process and their oils so pure and special? A. Check this out. This is the website that is making all the other fake essential oil companies nervous. This is another one of my favourite videos that beautifully captures how they source their oils indigenously (meaning, from the part of the earth where the specific plant/root or stem grows and thrives in its natural habitat.) This is what creates the most effective essential oil, in terms of its therapeutic results. Q: Is there a membership when you join or how does that work? Q. I've heard a few people online slam essential oils, mostly around fears with using them safely. What's up with that? A. The short answer. Some people are triggered by the sheer greatness, expansive innovation and pioneering effect doTERRA and essential oils are having on the world. So they attack and defend their belief system. I don't give one second of my time to people like that and I'm sure if you've landed here you're the type of person who 'sniffs out' this type of behaviour as well. Something I find interesting is that for years and years people have been buying essential oils on the store shelf with zero education. Like me, a few years back, when I picked up a bottle of lavender from the health food store when I was a cop. I had zero training, no one in the health food store told me anything when I purchased and I actually discovered later on that this specific brand of oils was actually really bad quality, sourced poorly and cut with synthetic ingredients. (Ouch!) And I was putting that on my skin. When I started with doTERRA, I was welcomed with open arms into a community that cares deeply. It felt like a warm hug to be completely honest with you. It was the supportive and loving, like-minded community that was missing from my life. The doTERRA blog and science blog has safe recipes and articles on safety, dilution, how to use and much more. Each person that buys essential oils receives a jammed packed welcome email with education guides on safety (a full 30-page guide), smart usage tips, using oils with kids and so much more. The odd person declines this additional support of course and as with anything, you’re going to get people who don’t listen and choose to ignore labels so it’s important to remember that. Top leaders have also developed e-books, 4-week programs that they provide their customer communities for free, tear sheets and safety sheets that we give out at oil classes. We don’t just stand there with a booth or a shelf and sell. The education, support and community is remarkable. We are ALL about education and I believe that’s why doTERRA has grown to become the #1 oil company in such a short time. They are setting an impressive benchmark that thousands of companies globally are now trying to replicate. Have you ever heard the business quote “The more value you give, the more successful you will become.” This is why doTERRA is great and changing so many lives around the world. You're in great hands here! Q. What do you believe holds people back from success in this and/or business in general? A. Fear. Anyone can do this. It’s fear. Of their potential, and of their power. Q. What do you believe holds people back from investing in their healthcare on a larger scale? A. They have to believe they are worthy of feeling their best. Society has brainwashed most people into believing this is not possible. A. Check out my post on why doTERRA and email me or the person who sent you, today: geralynmariepower@gmail.com. I’m so pumped you’re honouring the pull of your heart strings. We’re going to create MAGIC together. When you order a minimum of 50 points in doTERRA product of your choice on the monthly-basis LRP program, you start off by earning 10% back in free product points. Before Vera was born, I especialy wanted to tune up my supplement game to ensure I was feeding my cells with the best of the best. I prayed. I asked. I received signs. I took action. Vera is currently 13 months old and has stunning health. Of course I’m not naive, I know certain things are outside of our control but there are so many things as a mum that I can influence. And I believe in taking personal responsibility for influencing our health, in a big way. Today I want to chat with you about my absolute favourite essential oil. I have used this blend almost daily since I began my essential oil journey! It’s called breathe, or easy air, if you’re in Canada. The women I attract to my work are usually on a path of trusting their intuition deeply. The part of themselves that knows exactly what they need to live and lead at their best. They are learning how to access this innermost power and they are connecting deeper, day by day, to the work they’re really here to do in the world. That clarity however, takes daily work. And, deeper clarity arises, the more you do and apply the work. And that’s where breathe essential oil comes in. I know, not exactly brain surgery or the deepest thought in the universe but can I be honest with you for a second? I don’t believe we need 'complicated' today and we forget how simple it can be to 'tune back in' to our power. Most women today are simply not breathing; They are running around on overdrive and that is hands down in my opinion the number one reason why they have trouble connecting to their inner wisdom. We need to slowwwwww down, feel, and connect. PS this is my fav pouch for carrying oils in my purse. As you apply breathe and take a big beautiful whiff, you’ll instantly feel grounded. It opens the airways, your breath reaches deeper into your body and you’ll notice your exhale will also get juicier. Did you know the body detoxifies through your exhale? Sometimes we need deep ones to really let go. The cool thing is, you can still experience the same benefits of a 20-min seated meditation, just in a simpler way that is wildly effective. Try this: before you head into a part of your day where you intentionally want to feel more present and peaceful, apply breathe to your chest, wrists and/or behind your ears. Take a few deep breaths and notice your surroundings, exhaling gently as you feel the urge to rush back into 'busyness'. Watch the magic that starts to unfold after that. I get it girl. You want to stock up. Or you want to get started with oils and leverage BOGO week as your starting point. It's the perfect time and that's where I come in. Step 1: If you’re curious to learn more about doTERRA I wrote an entire post on how they’re changing the healthcare game and empowering the most people on a global scale HERE. Grab a coffee and read through. Then join my exclusive PROMO group on Facebook where I announce the BOGO’s a few times per year. I run this group in collaboration with some amazing friends and fellow business partners. CLICK HERE to join the group. The daily BOGO is announced by 7am each day in the Facebook group. We also go live with trainings on exactly how to use your oils. For customers exclusive to us who lead the group you’ll also enter to win a few bonus giveaways that we only offer 2-3x year. If you do not have a wholesale account that's how you purchase doTERRA. It's like Costco. You purchase a one time membership for $35 US / $42 CND and then you receive your oils at wholesale cost (25% below retail) for 1-year. If you would like to renew your wholesale membership at the end of the year it's $25 and doTERRA sends you a free bottle of peppermint for renewing. Send me an email asap and I'll hook you up with a wholesale membership if needed: geralynmariepower@gmail.com (I also have an exclusive oil cove you'll be added to right away, where I mentor women behind the scenes along their wellness journey). The group is light, spacious, vibrant and fun. Step 3, for current wholesale members to order BOGOs: Visit www.mydoterra.com and enter your wholesale customer # and your password. Step 4: Add the daily BOGO to your cart and then the free BOGO oil will self-populate. doTERRA has a promotion page with instructions found here as well. There is a limit of 6 BOGOs allowed per home per day. They typically sell out by noon. 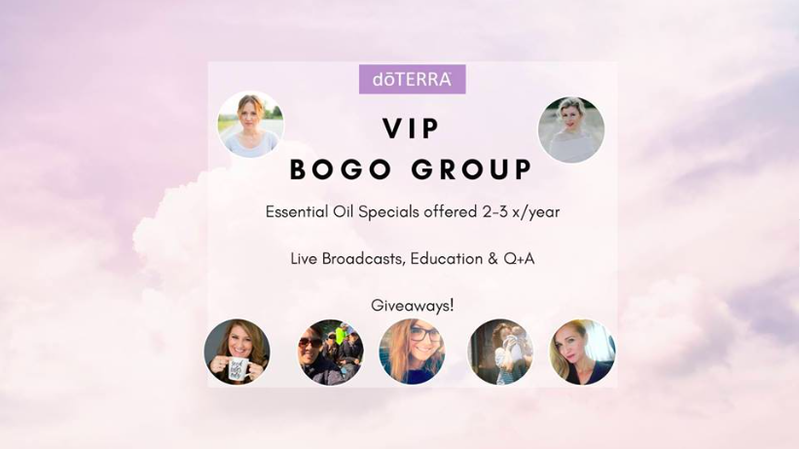 Some days the doTERRA US warehouse offers a different BOGO than the CDN warehouse. Canadians can order the max from both. Shipping is approx $13 from the US and $6 from Canada. If you order the BOGO through your LRP cart (the Loyalty Rewards Program) you'll receive your shipping back in product credits. If your daily LRP order is higher than 50 points in product you'll also earn at least 10% back in free product points, depending on your LRP status and how long you've been on the program. If you already have a monthly LRP order and you're adding an additional LRP template to order on BOGO day, simply add the BOGO oil to your new LRP cart. If you want any additional product, add that to your cart. (Remember, it's smart to bump it up to 50 points if you're close, so you get the additional 10%-30% in product points. If you've been on LRP for awhile, you may be earning more towards the higher end at this point.) Then click 'ship now'. After you've clicked the 'ship now' button, go back and delete the BOGO template you just shipped off. You'll do the same thing for each of the 5 BOGO days. Your regular LRP order will stay intact for the week. Tea tree is one of my fav 'essential' oils. It's known for it’s deep cleansing properties. Here are my top 10 uses for around the home. 1. Keep a bottle in your bathroom and use it to cleanse makeup brushes and earrings 1x per week. When I first started getting serious about my desire to learn how to create success in business, I was drawn to many self-help books, leadership books and mindset books. One of the first books I ever read was from a super successful business leader and I thought it was going to be all about how to create a wealthy business because the title alluded to that. But once I started to flip through the pages, I discovered something: wealthy people are good at their craft, yes. They understand how to give value to the world, and they do so, earning money for something the world needs. They solve problems for people with their business and/or product. They care, they are good listeners, they have leadership skills. My intention with writing this post is to reach women who have not yet given birth, but feel the desire to bring a child into the world in a beautiful and gentle way. My intention is also to reach women who are ready to open up to the lesson of surrender, whether that’s in childbirth, business, or a unique life transition. I woke up this week feeling a bit uncomfortable and knew I was heading into a stretch phase in my business. It happens at every new level. For example, maybe you’re launching a new coaching program or maybe you just hit a new income rank in your business. AROUND THE CORNER FROM A BIG SUCCESS, IS THE STRETCH PHASE. I've learned that if we ignore the work within the stretch phase, it’s very easy to simply slide back down. So it’s important that we honour this phase. It actually propels deeper momentum forward, if we’re willing to honour it and do the work. I’ve learned through the past few years how to navigate this season. And although I’m still learning and a forever student, I wanted to share my thoughts and tips with you today. Acknowledge that you’re in the stretch and don’t run. Most people sacrifice their success because they’re afraid of feeling uncomfortable. I’ll get to this more in a minute, but what if we labelled the stretch a bit differently so we welcomed it in more? For example, if we really look at it, it’s actually just an uncomfortable feeling or sensation in our bodies. It’s not that the work you’re about to take on is actually hard. It just feels hard. But, if you stay “in” the process and do it, the feeling of hard fades, and your freedom, health and abundance deepens. Within every stretch phase there are new skills, ways of being or action steps that your heart will tell you to take. This one is pretty straight forward. You’re either courageous enough to sit down and write on paper what that is. Or, fear will take over and you'll resist this part. If you opt for option #2, the stretch phase is over and you’re officially “stuck.” No one wants to be or live within that space but unfortunately many people do because they are afraid of what their heart is asking them to do. Now that you have a list of what your heart is telling you to do within the stretch phase, start taking action immediately. Expect it to feel hard, but understand that it’s a temporary feeling. This is where you have to build some trust muscles as well, and look at the examples of those who have gone before you. I had to trust my mentors and teachers and favourite personal development authors when they told me to just go for it. They all said my freedom, abundance, vitality and impact would grow, the more I took courageous action but unfortunately in the world of business, there are no tangible guarantee’s, so our fear deepens. For example, when you run a marathon you know it’s a given you’re going to get a cute ribbon at the end for participating. In the world of entrepreneurship, you’re out there on your own and you have to trust what your heart is guiding you to do. Which is the entire point though and a deep life lesson. What would be possible if you trusted her? Do you really think she would lead you astray? My first yoga teacher Baron Baptiste had certain principles that guided his teachings. One of them was “In order to heal, you need to feel.” I used to attend his week long yoga intensive trainings and at times I found myself in a pile of tears while lying on my yoga mat. He would push us and challenge us to stay “in” the yoga practice, which was quite challenging and he did this on purpose with long days and hours and hours of yoga. It was so intense and literally forced us to get quiet, move our bodies and just breathe and be present. Some people got so uncomfortable with what "came up for them" within the deep presence that they would quit or go home. Some just cried and released. It sounds deep, but if you think about it, it’s a very simple concept to understand. Many of us humans block our emotions and we’re therefore storing lots of fear in our cells. We don’t want to get quiet, or sit still, for even a short moment, because that would cause us to have to “look” at our unhealed stuff. Over the last 4 years as I’ve built my business, I have enveloped my heart in deep healing. I have cried, I have released, and I have transformed. And, it's been a key cornerstone to my success. And, it still happens to me at every new stretch phase. I’ve realized this is actually where we gain our deepest power, through healing. But in order to do that, we need to feel. This one is quite personal for me. During many “stretch” phases I’ve made mistakes. Nothing too crazy but within the healing, the feeling and the releasing, sometimes my energy has gotten the best of me, sometimes I took action on something without knowing how to do it yet and the email maybe didn’t come across in the best way. Sometimes I would be in the stretch and feeling uncomfortable and my brain was mushy and overwhelmed, so my mentor calls were not the best or the way I showed up for my husband on that day was not the best. You can sit in fear around the “how” and fear around showing up imperfectly and then never take action. OR, YOU CAN SHOW UP AND DO YOUR BEST, AND UNDERSTAND THAT YOU WILL FAIL FORWARD AND YOU WILL MAKE MISTAKES. Again, it’s temporary. You’ll get better. Your skills will enhance, and in fact, this is the only way they’ll enhance, by trying your best with what you know. You’ll eventually learn new skills, you’ll make refinements and then you’ll be able to handle your new level with grace. I touched on this in point #5, but make sure you’re open to growth and refinements. I believe there is nothing more dangerous than someone who just pushes through the stretch phase, because eventually, we're going to have to face our stuff. And, if you wait until you have a massive business, and massive responsibility, how is that going to feel when it all gets compounded on top of you? The entire point is to feel more free at each level, so it's key to ensure you're allowing your business to do it's "work" within you, at each level. The good news? On the other side of the stretch is the most beautiful freedom. I usually last a few days to a week in a stretch phase now and then I start to vibrate at a higher frequency and I step into a deep flow. I used to last months in a stretch phase because I was resistant to doing what my heart was telling me to do. I’ve learned from those experiences however and now I just do and then enjoy the sweetness on the other side. If you’re a woman passionate about stepping into the leader you’re really here to be, if growth, freedom, and impact are important to you then I need to do my job and tell you that another stretch phase will come. They always do. But they get shorter and easier each time, as long as you’re committed to doing the work. AND, YOUR FREEDOM GETS DEEPER AND RICHER AND SWEETER EACH TIME TOO!